How do we extend the product life cycle and engage kids for longer periods of time during their grief journey? Created as a line extension for the Draw It Out brand, the Memory Bank proved to be a useful tool in brand recognition to increase usability and brand loyalty. During the research phase for the development of the Draw It Out workbook, I discovered that children were often overwhelmingly upset that they began to forget details about the person who died—details that may not seem important to adults, but to the children, these were attributes that made up their memory about that person...what that person's favorite color was, the funny way they ate their cookies, even what they smelled like. 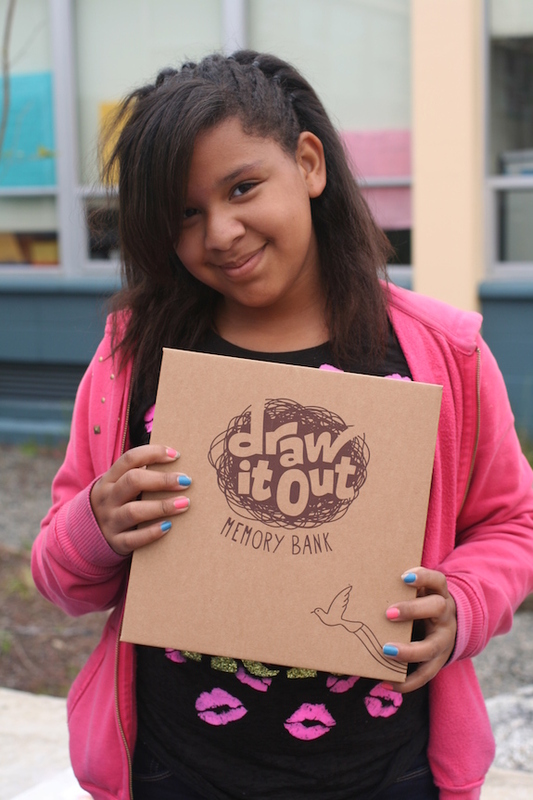 The Draw It Out workbook begins to help children capture some of these memories, but there was an opportunity to create an additional tool as well. I designed the box to seal on both ends as securely as a FedEx box to prevent prying eyes from "peeking" at the contents. On the flaps that sealed, I invited the children to draw feelings they wanted to keep private. Then, once sealed, only they would know what they drew. The die-cut is small enough to keep adult fingers from fishing papers out. The back invites children to dedicate their box to the person they miss, but also invites them to personalize the box as well. I worked with an art therapist to come up with five different prompts to provide a baseline understanding that memories both big and small were worth keeping. The pads contained 50 sheets in total to give them plenty of opportunities. I worked with the printer to create a box template that was both cost-effective to produce but was also cost-effective to ship and I chose standard size notepad to keep costs down. I found two donors to cover all the costs of production, meaning that 100% of the proceeds could go back into programs. I made sure that the product was ready for shipping by the summer Child Life Conference that Art with Heart attended every year—an audience of our most frequent buyers. We used this as a goodwill tool to increase use of the products in the bereavement industry. "Before receiving the Memory Bank, when Samantha, our youngest, had memories of her sister, her eyes would well up with tears—the memories brought all her grief right to the surface. Having [the memories] in a safe place gave her the peace of mind that those experiences and moments with her sister will never be lost. Now when she has a memory, she gasps with excitement and runs to the pad, where she can write it down, knowing that it’ll never be forgotten. Our box is full to the very top and we plan to take all the memories stored in the box out and make a scrapbook of them. Then we will place the box back on the shelf and fill it up again. This box has represented all the happiness and fun our family experienced with Emilie. What a gift."